Is R.A. the Anna Claus, part II? 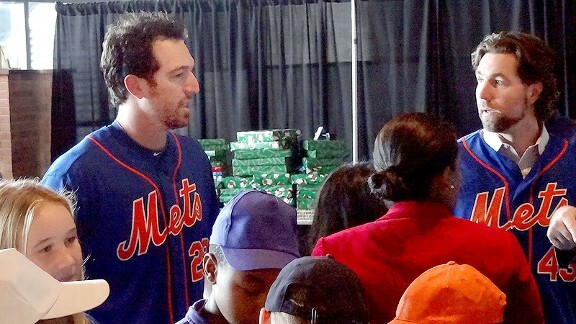 R.A. Dickey's final public appearance on behalf of the Mets came at Tuesday's holiday party for schoolchildren, alongside Ike Davis. So R.A. Dickey's final appearance wearing a Mets jersey turned out to have been at the team's holiday party, when he offered pointed comments about the direction of contract-extension negotiations. Did that play a role in his departure? After all, there seems precedent. Anna (Claus) Benson created a stir at a Mets holiday party in 2005. Seven years earlier, Anna Benson came to the holiday party for schoolchildren -- then at Shea Stadium -- with a low-cut red dress. And that, coupled with her sharp tongue that included a shot at Carlos Delgado for not standing for the "Star Spangled Banner," helped get husband Kris Benson booted from Flushing later that offseason via trade. In this case, Dickey likely did himself no favors with his directness about contract negotiations. And it is complicated and calls for speculation about whether Dickey talked his way out of Citi Field. Still, Sandy Alderson -- it seems reasonable to speculate -- seemed predisposed to wanting to jump on a deal that would net two top prospects in return, rather than re-sign a 38-year-old pitcher. That said, David Wright's new contract demonstrates how a goodwill-based relationship with ownership and being a good citizen can benefit you within the organization. Dickey, on the other hand, never enjoyed similar high respect. That's partly a function of Wright versus Dickey's longevity with the organization giving Wright more of an opportunity. But the directness of Dickey's articulate comments often did him no favors, either -- and well before the contract situation. Dickey, for example, definitely irked brass with his comments about the ballpark and its effect on Wright before the reconfiguration. Bottom line: Comparing R.A. to Anna would be a stretch. But behind the scenes -- including with teammates -- Dickey's relationship with the Mets wasn't as romantic as his relationship with the fans.